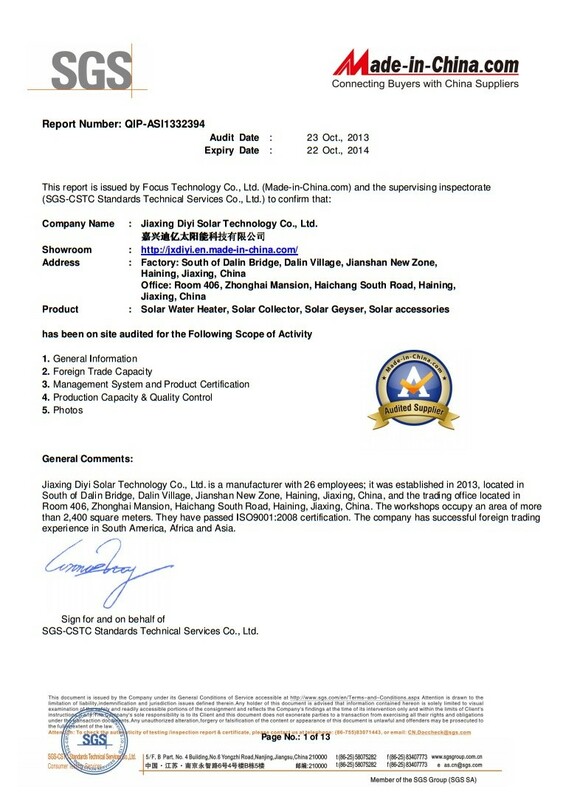 Company Overview - Jiaxing Diyi Solar Technology Co., Ltd.
6YRSJiaxing Diyi Solar Technology Co., Ltd.
Jiaxing Diyi Solar Technology Co., Ltd. is located in Haining City, Zhejiang Province, in the East of Shanghai and west of Hangzhou with the convenient transportation, covering a total area of 3,000 square meters. Through 8 years' development, we have the annual output of 50,000 units of solar water heater. 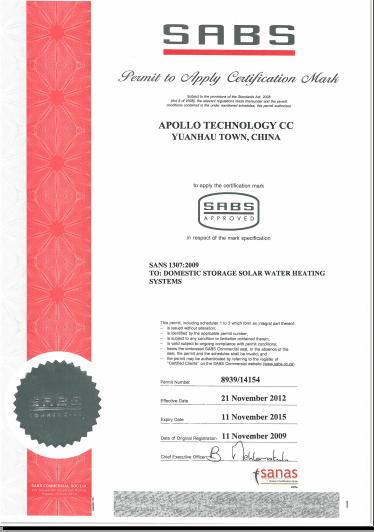 Also, we have successfully entered Europe, Africa, South Korea, Australia and Southeast Asia with our unique advantages in stable quality and competitive price.As a manufacturer owning the most advanced manufacturing equipment for producing vacuum tube solar water heater and solar collector, we have got the powerful certificates, such as ISO9001:2000 certificate, SABS, Solar Keymark and SRCC. We are specialized in vacuum tube solar water heater, solar collector and high pressure solar water heater. 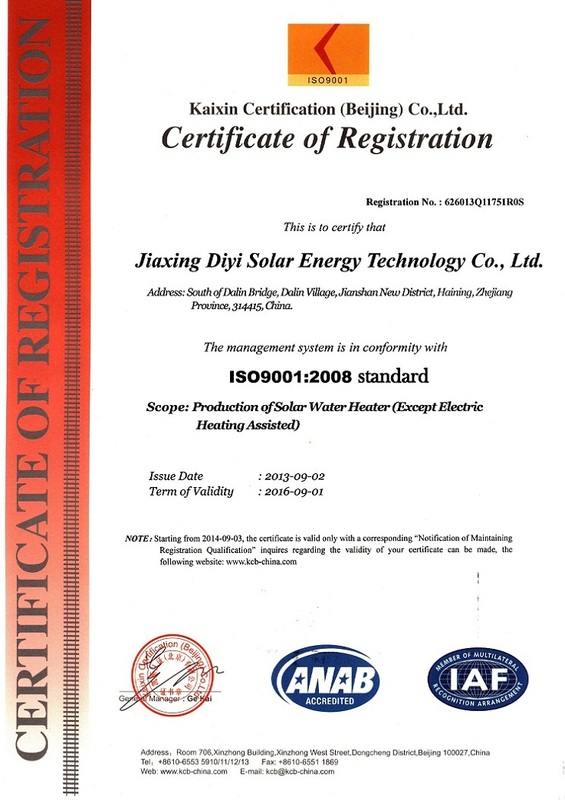 Now, our factory is in Haining City, Zhejiang Province, for producing solar collector and solar water heater with our own brand-"DIYI".Also we can produce specified products according to customers' designs or samples.Meanwhile, as a manufacturer, from the initial tube source to final finished products, we exactly control our quality at every working procedure in order to supply the best quality for customers. We also have a good after-sales service system and can gain the feedback in time.We warmly welcome both domestic and overseas clients to create the win-win cooperation, and we are looking forward to having opportunities to become your future supplier. Both OEM & ODM are acceptable. All your attention and support will be highly appreciated. water tank,vacuum tubes,feeder tank,stand and so on.